A vacuum tube, also called a valve in British English, is an electronic device used in many older model radios, television sets, and amplifiers. The cathode is heated, as in a light bulb, so it will emit electrons. This is called thermionic emission. The anode is the part that accepts the emitted electrons. The device may have other parts. Vacuum tubes must be hot to work. Most are made of glass, thus are fragile and can break. Vacuum tubes were used in the first computers like the ENIAC, which were large and need much work to continue operating. John Ambrose Fleming invented the first vacuum tube, the diode, in 1904. Lee De Forest invented the "audion" in 1906 (which was improved by others as the triode in 1908) and used in the first telephone amplifiers. Many other kinds were invented for various purposes. 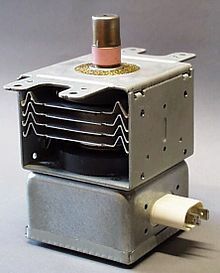 The transistor became cheaper in the 1960s and was much smaller, worked on lower voltages, and used less power. In addition, unlike vacuum tubes, they were much less likely to be damaged by being dropped and had extremely long life. Eventually, they were also much cheaper than glass vacuum tubes. At this time, most radios, television sets, and amplifiers began using transistors instead. High powered electronics such as broadcasting transmitters were transistorized more slowly. Television receivers continued using the cathode ray tube until the mid-2000s. Systems which need high frequency operation, high-power output or very high amplification, such as television transmission, X-ray machines, radar, and microwave ovens. People who enjoy listening to music on high-quality home stereo systems sometimes buy amplifiers which use vacuum tubes. (See tube sound). Musicians who play electric musical instruments such as electric guitar sometimes use vacuum tube amplifiers. Vacuum fluorescent displays, which are thin vacuum tube displays that display simple information such as numbers, are still fairly common in audio / video equipment and household appliances, although they are being replaced by LED displays. Several niche applications, such as photomultiplier tubes. ↑ "History of the Vacuum Tube". ↑ "How Vacuum Tubes Work". This page was last changed on 15 March 2018, at 11:25.